Download the info flyer about Parkour offered in Beeville. Pakour, the art of movement, is a combination of running, jumping, vaulting, climbing and moving efficiently. Parkour will be offered outdoors at the cmapus walking trail in Beeville, on Tuesday and Thursday nights, March 20-April 19, 6-8 p.m. The beginner’s course is five weeks and participants can earn 2.4 continuing education credits. The minimum age is 15 for this class. There is no maximum age restriction. The beginner’s course emphasizes safely falling, balancing and precision jumping. Participants should wear loose, comfortable clothing and shoes with gripping soles. No special equipment is necessary. Tracuers Jennifer and Taliesen McCall take a simultaneous leap. McCall is certified to teach Paukour. She is CPR certified. 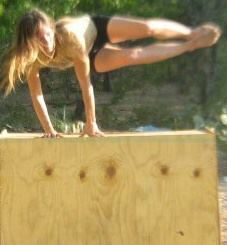 Her interest in Parkour came out of a desire to be active. “After my children were born, I wasn’t getting to go out and play anymore,” she said. She searched the internet for an activity that she could do that didn’t require a lot of preparation and was something she could do with her kids close by. She watched an online demonstration of a French Parkour group and thought it looked interesting. During a mundane visit to the park with her family, McCall saw a local group working out and begged to join. 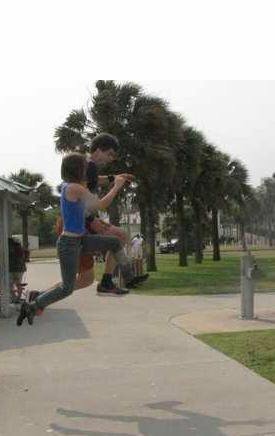 Today, she and her husband, Taliesen, are a part of the Corpus Christi Parkour group. “Parkour has discipline. It’s almost spiritual,” she said. What enticed her to the sport was the fact that she had no discipline for weightlifting and found Parkour very similar to child’s play. McCall works out with an advanced group regularly. She said a traditional session includes a 45-minute warm-up, a two- to three-hour workout, and a 45-minute cool down. They use public spaces and parks. “Everywhere you train, we clean. We leave the grounds cleaner than we found them. Building connections in the community is important to our group,” she said. One important aspect of Parkour is its connection to its urban environment. Tracuers, Parkour athletes, use public spaces to engage in the sport. Parkour is a quirky activity, according to McCall, and caters to the fitness needs of a diverse group of athletes. Most of the participants are fit young men who are in shape, but not athletic. Gamers and martial artists enjoy Parkour, as well as mothers looking for a low-preparation activity and fathers looking to regain some of their physical prowess, according to McCall. Parkour is also a release for children and teens to expound pent-up energy. By offering the class in Beeville, McCall hopes to create more Parkour ambassadors while helping people get in shape and put their personal limits to the test. For more information about the upcoming Parkour sessions, contact CBC Continuing Education at (361) 362-2633 or go to www.coastalbend.edu/ce for more information.